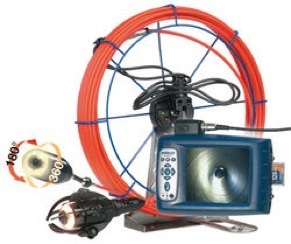 Chimney Savers uses the Wohler VIS 2000PRO for Level 2 Inspections of chimneys, and also for video inspections of ventilation lines, vents and pipes. The camera allows us to detect leakages and defects. Because of the remote control pan and tilt camera head with built in LED lighting, we can light up and thoroughly inspect every spot. The results of the inspection can be recorded to a memory card in the instrument either as pictures or videos. An Important Note: The main purpose of a chimney inspection is to find fire safety and structural issues, while structural issues often cause draft issues, draft issues do not always stem from a structural issue. So when diagnosing draft issues an inspection is the best place to start, but it is not always the end of the process. Doing the appropriate level of inspection to make sure that the chimney is structural sound is always the first logical step, but finding the cause of a draft issue can be a completely different process from an inspection. On January 13, 2000, the National Fire Protection Association adopted three levels of inspection into code NFPA 211 (Standard for Chimneys, Fireplaces, Vents and Solid Fuel Burning Appliances) Inspections are now clearly defined as Level 1, Level 2 or Level 3. NFPA 211 is the professional standard upon which chimney sweep services are based. CSIA Certified Chimney Sweeps are tested to these three levels of inspection. 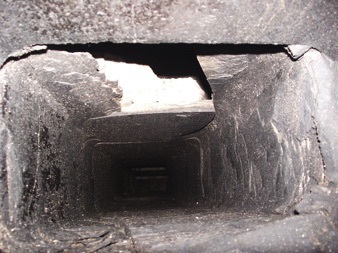 Always ask for the level of inspection that you believe will be most appropriate for your chimney and venting system. Each level of inspection covers specific items depending on the individual appliance and venting system. You should be given a copy of the inspection report which includes a checklist and the condition of each item should be noted on the inspection report. (Click the links above the inspection level description to see the actual inspection report check lists used by our technicians. Level 1 has one page. Level 2 has two pages. Level 3 has three pages.) Below is an explanation of the three levels of inspections and what services your chimney service technician should provide for each level. Level 1 Inspections - If your appliance or your venting system has not changed and you plan to use your system as you have in the past, then a Level 1 inspection is a minimum requirement. A Level 1 inspection is recommended for a chimney under continued service, under the same conditions, and with the continued use of the same appliance. In a Level 1 inspection, your chimney service technician should examine the readily accessible** portions of the chimney exterior, interior and accessible* portions of the appliance and the chimney connection. Your technician will be looking for the basic soundness of the chimney structure and flue as well as the basic appliance installation and connections. The technician will also verify the chimney is free of obstruction and combustible deposits. A Level 1 Inspection is performed with a basic chimney sweep. Level 2 Inspections – A Level 2 inspection is required when any changes are made to the system. Changes can include a change in the fuel type, changes to the shape of, or material in, the flue (i.e. relining), or the replacement or addition of an appliance of a dissimilar type, input rating or efficiency. Additionally, a Level 2 inspection is required upon the sale or transfer of a property or after an operation malfunction or external event that is likely to have caused damage to the chimney. Building fires, chimney fires, seismic events as well as weather events are all indicators that this level of inspection is warranted. A Level 2 inspection is a more in-depth inspection than a Level 1 inspection. A Level 2 inspection includes everything in a Level 1 inspection, plus the accessible portions of the chimney exterior and interior including attics, crawl spaces and basements. It will address proper clearances from combustibles in accessible locations. Level 3 Inspections – When a Level 1 or Level 2 inspection suggests a hidden hazard and the evaluation cannot be performed without special tools to access concealed areas of the chimney or flue, a Level 3 inspection is recommended. A Level 3 inspection addresses the proper construction and the condition of concealed portions of the chimney structure and the flue. Removal or destruction, as necessary, of permanently attached portions of the chimney or building structure will be required for the completion of a Level 3 inspection. If your chimney is already clean, we can just do an inspection. If your chimney is dirty we must sweep it before we can inspect it. 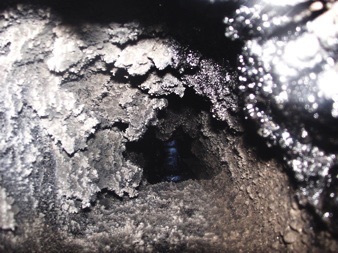 Take a look at what the dirty flue below was hiding. There would be no way to see this without sweeping the flue first.